Since August of 2010, volunteers and employees of Moab Solutions and CCR have been at the Moab Post office at 9am on the third Saturday of every month to collect the mixed paper that was not able to be collected at the Community Recycling Center. During that time, a staggering 260 tons of mixed paper was collected at the Paper Drives, backhauled to Provo using postal trucks, and picked up for recycling by Rocky Mountain Recycling. Almost 50 tons of mixed paper were collected in 2014 alone. On average, between 15 and 20 of the large Post Office bins were filled each month during the short collection time on Saturday mornings. In 2010, the Moab Post Office began participating in the Postal Service Post Office Box Lobby Mail Recycling Program, and the two local recycling organizations saw an opportunity to use this program to greater increase recycling access in Moab. Moab Solutions had been running an “underground railroad” of paper recycling by getting volunteers who were heading up to Salt Lake City to stuff their cars full of mixed paper and drop it off at collection sites in SLC. Once the Post Office started collecting mixed paper, Rani Derasary, former Program Director at CCR, saw an opportunity to use their backhauling program to give the opportunity to recycle types of paper that were not otherwise recyclable here in Moab. Beginning January 2nd, 2015, The Community Recycle Center on 1000 Sand Flats Road started accepting all Paper Drive materials for recycling and begin ongoing collection of the following types of mixed paper: egg cartons, paperboard (like cereal boxes), brown paper bags, toilet paper and paper towel rolls, magazines, catalogues, phone books, calendars, hardcover and paperback books, wrapping paper, paper packaging and junk mail. The Community Recycle Center already accepts office paper, newspaper and cardboard for recycling, and the Solid Waste District expects to collect a lot of mixed paper once collection is every day during business hours. It will be important for people to carefully separate their paper recycling as the Solid Waste District makes more money on bales that are only cardboard, newspaper or office paper, and will not get as high of a return from the mixed boxes full of Paper Drive materials. People will also need to remove spiral bindings, plastic cover sheets, metal cutting strips and other non-paper items that are often attached to recyclable paper. Just like with all other recyclables, items that are contaminated with food cannot be recycled. “The most common unacceptable item we saw at the Paper Drive was milk cartons or ice cream containers, really anything that’s paper on the outside and holds liquids inside. That type of packaging can’t be recycled here because it’s just too waxy.” says Scott of CCR. Green Solutions, a private business that does curbside recycling, will start picking up mixed paper materials on the first Wednesday of the New Year, January 7th. “We ask our customers to separate the Paper Drive materials from other recycables, and only put out a blue bin’s worth, as we are still working on how we will accommodate the new materials. We are waiting to see how much this affects our pick ups to determine a need for a price increase or additional bins for customers,” says Brad Woodford, owner of Green Solutions. The Moab Post Office will continue to participate in the Postal Service Post Office Box Lobby Mail Recycling Program, along with 111 other Post Offices in Utah and more than 9,000 Post Offices across the country. This program does not allow for any collection of household paper waste, but is intended to get Post Office Box customers to “Read, Respond, Recycle” by opening their mail, taking whatever action is necessary then using the bins to recycle the rest of their mail. 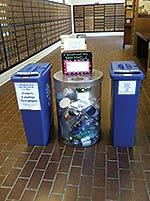 Post Office customers in Moab might notice the official USPS blue bins as well as the clear collection bins for other types of recycling. The clear bins are maintained by Moab Solutions and intended to capture any recycling that people might have on them while running errands and visiting the Post Office, such as plastic bottles, aluminum cans or newspaper, but is also not intended to be a drop off for household recyclables. For more information, the media is invited to contact Abby Scott, the Program Director of Canyonlands Community Recycling. She can be reached via email at CCR@MoabRecycles.org or by phone at 801-718-6080. © 2002-2018 Copyright Moab Happenings. All rights reserved.